Is Lipoprotein(a) Ready for Prime-Time Use in the Clinic? 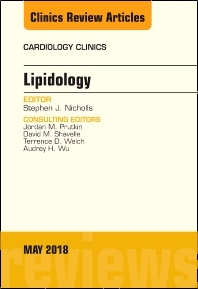 This issue of Cardiology Clinics, edited by Dr. Stephen Nicholls, focuses on Lipidology. Topics include, but are not limited to: Impact of lipoproteins on atherobiology; Lessons from genomic studies; Lipids and lipoproteins in risk prediction; Optimizing statins and ezetimibe in guideline focused management; Statin intolerance; Lipid lowering agents and diabetes risk; PCSK9 inhibitors; Bempedoic Acid; Triglyceride rich lipoproteins; Omega 3 Fatty Acids; Lipoprotein; CETP inhibitors; HDL infusions; and Targeting HDL functionality.